I can’t stop loving all the song of the band called sumika I mentioned in this blog the other day. There wasn’t even a single song that I don’t like in their 1st album “Familia”. There should be many albums I love that way, but actually not that many. 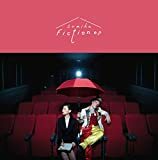 If someone asks me about albums that I love every song without exception in it, the first one which comes into my mind is “DOCTOR HEAD'S WORLD TOWER” by Flipper's Guitar, then some other ones like, “Life” by Ozawa Kenji, Shiina Ringo’s three albums from the 1st to 3rd, “First Love” by Utada Hikaru, and “Game” by Perfume. It’s been a long time since I met an album I loved all the songs in it without exception. I’m also listening to an E.P. “Fiction” which includes four songs, and this is perfect for me, too. I know it is humiliating for artists to be said that their songs sound like someone else, but when I listen to sumika I somehow feel some their songs sound like sometimes Back Number, sometimes Mr. Children, sometimes Southern All Stars, and sometimes even Tokyo Ska Paradise Orchestra. Even so, they definitely have genuine originality, I realize sumika is a really great band.